This highly stylised yet superbly fluent pencil drawing is one of numerous figure studies related to Klimt’s most controversial public commission: the so-called ‘faculty paintings’ for the University of Vienna. In 1894 Klimt was invited by the Austrian Ministry of Education to assist with the ceiling decorations for the university’s new assembly hall. The commission stipulated a sequence of five allegorical paintings: a central canvas depicting the triumph of light over darkness, with four encompassing compositions representing the faculties of theology, philosophy, medicine and jurisprudence. Of these Klimt was to execute the last three. During his years working on the monumental canvases Klimt became deeply involved with the Vienna Secession, which brought him into contact with the European avant-garde. The first full-scale painting, Philosophy, was completed and exhibited in 1900, with Medicine appearing the following year. The finished canvases – an idiosyncratic blend of Pre-Raphaelitism, Art Nouveau and the more extreme forms of Dutch and Belgian Symbolism – marked a drastic departure from the studies Klimt had originally submitted. With their determinedly flat patterning and ornamentation, the canvases were not only stylistically surprising: they eschewed the idealising conventions of academic practice and their message appeared irrational, pessimistic, even antithetical to the Enlightenment program envisioned by the patrons. Philosophy and Medicine were unremittingly criticised. But the canvas that provoked the strongest indignation was Klimt’s last faculty painting, Jurisprudence 1903–07. When all three paintings were displayed at the 18th Secession exhibition in 1903, the university finally distanced itself from the project and Klimt renounced the commission. Klimt acquired the paintings for himself, continuing to make changes to them until 1907. They were destroyed by fire in the Second World War. 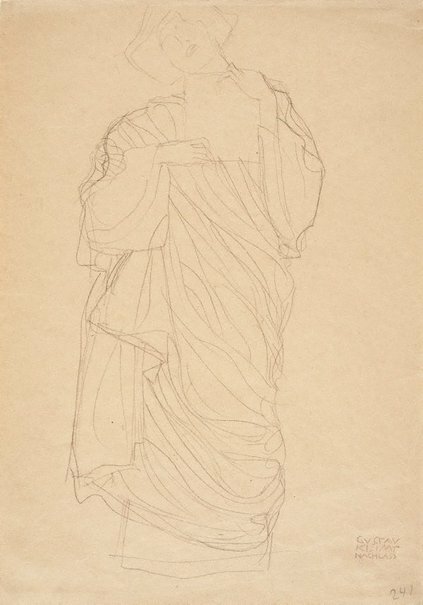 The Gallery’s study of an ethereal robed figure is preparatory to the personification of Law in the painting Jurisprudence. Shown holding a book with the word Lex, the figure of Law – together with that of Truth – flanks the central figure of Justice who presides over the composition. Prints & drawings Europe 1500-1900 , Sydney, 2014, col illus p 183.